The 12-year wait for France is over with the qualification for the London Olympic basketball tournament. Now the big question for France and for Pierre Vincent is how ready France are to challenge for one of the three medals. France travelled to Sheffield, England for a 4-nation tournament for their first three matches. It did not go well with just one victory against Angola (79-51) and then France were beaten by Australia (69-59) and the hosts Great Britain (74-67). Then France completed their preparation in France by hosting Australia, Brazil and China. The results were better as they first beat Brazil (67-57). The following day they walloped China (85-64) and closed the tournament with a victory against Australia (64-58). 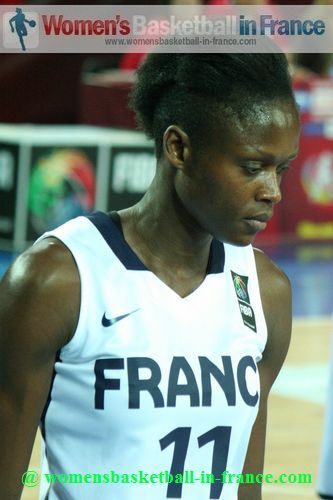 The only concern for France was the fitness of Emilie Gomis (in picture) who sat out the last two preparation games. Pierre Vincent's pre-Olympic objective for France was to prepare against teams with different styles of basketball with the aim of the French team peaking at the Olympic Games. With the exception of Gomis, this is the first time that Vincent is able to go to a major competition with his chosen roster all fit. France did not play the most exciting basketball this summer but they appeared to have mastered the required systems and are as ready as any team. France are in Group B alongside Russia, Australia, Great Britain, Brazil and Canada. This is a tough group on paper but a top four finish is expected. At the 2000 Olympic Games in Sydney France were drawn in Group A with Australia, Brazil, Slovak Republic, Canada and Senegal. France finished second behind the hosts Australia and were drawn against Korea in the quarter-final. When France were beaten by Korea (68-59) they had to settle for a fifth place finish after beating Russia in the classification match (71-59). The players from France in 2012 would love to do better.